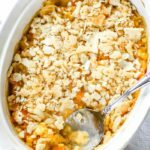 Easy corn and noodle casserole that is sweet with a bit of crunch from the crumble topping made from crackers. Pull this old fashioned recipe together for a unique side for dinner. 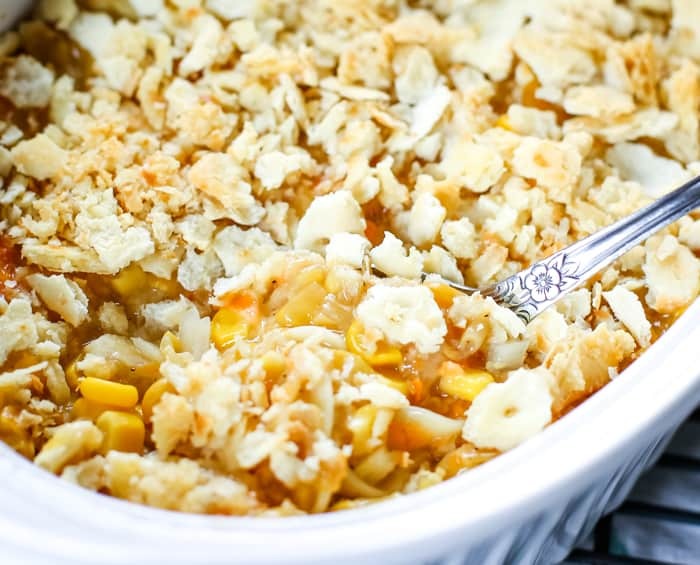 When I first stumbled onto this corn and noodle casserole I was a bit perplexed. 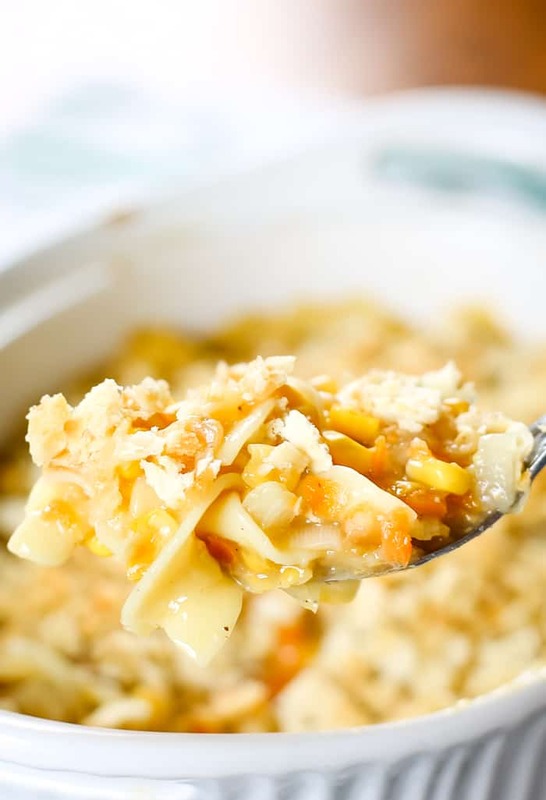 Corn and noodles are not two things I think of going together – most of the time. But like most old fashioned recipes I find these days, they’re a bit different but typically very tasty. So I dove in – and loved it! 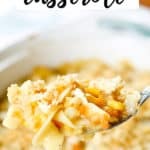 I wasn’t really sure what to call this recipe because it’s a corn casserole but it’s not like the kind of corn casserole I typically think about and that’s because of the noodles. So corn and noodle casserole it is. 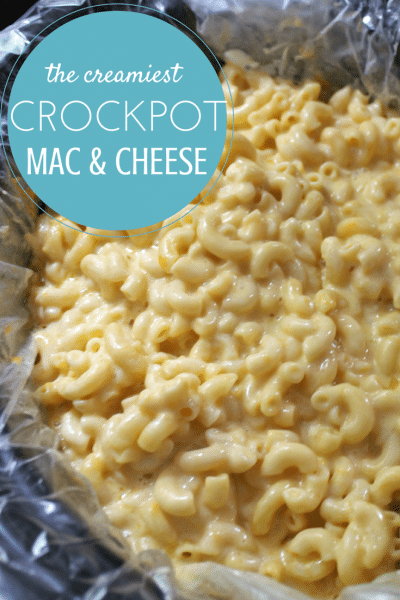 Combine all ingredients in a bowl and transfer to a greased 1 quart baking dish. You can use a 8×8 square baking dish or a 1.5 quart dish like I did. Toss crushed crackers with butter and sprinkles over the top. After I made this recipe I wondered if maybe I should have pulverized the crackers first instead of just crushing them? I turned out fine but I might make it differently next. What do you think? 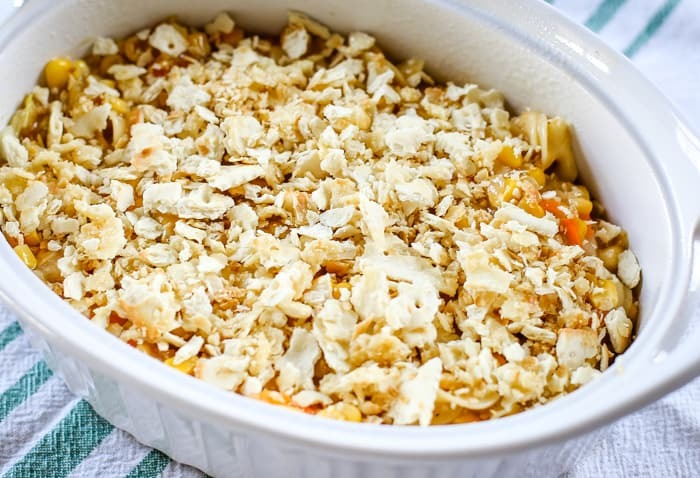 Bake for 45 – 50 minutes in a 350˚F oven or until bubbly and fully cooked. Serve warm. This unique combination of flavors really works together. In fact, as someone who loves texture in my food, I really love it! This would be a perfect side served with a big slice of ham or a venison roast. 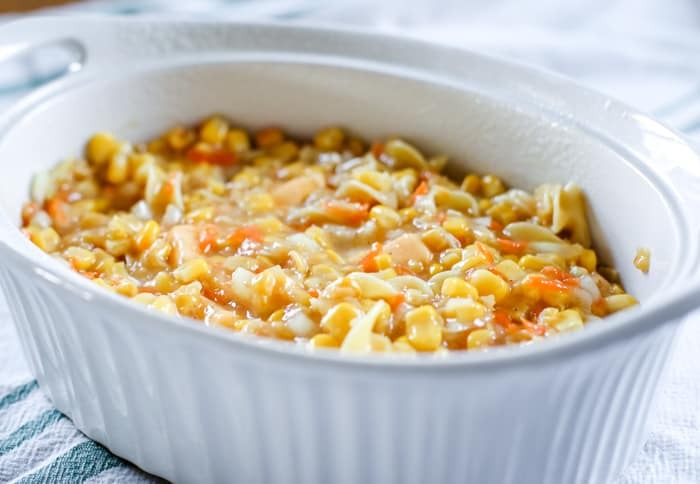 A good hearty protein to compliment the sweetness of the noddles and corn – yum! Each bite is truly packed with flavor. Who am I to keep noodles and corn apart? Am I right? I hope you enjoy this unique old fashioned side dish as much as our family does. Boil water and cook egg noodles until al dente. Drain and add noodles to bowl. 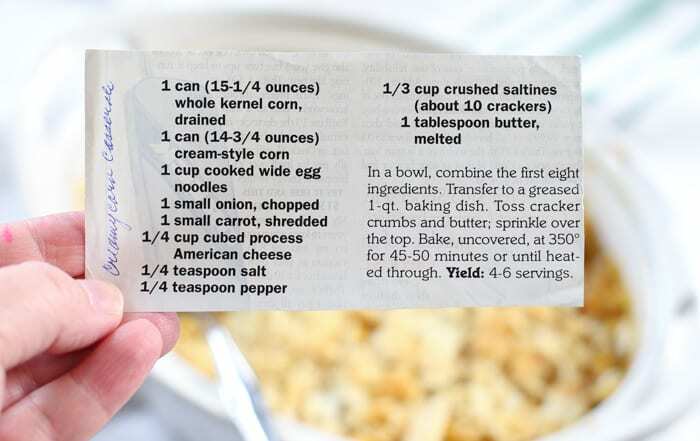 Combine all ingredients (except for crackers and butter) in bowl. Transfer to a greased 1.5 quart baking dish. Toss the crackers with the melted butter. Sprinkle over the top of the corn mixture. Bake uncovered for 45-50 minutes or until fully cooked.